Select a 'Case Study' from the menu on the left. The York Roast Company is a fast growing chain of food outlets based across the UK. The company serves freshly roasted hand carved meat sandwiches, Yorkshire pudding meals and refreshments to eat in or take out. Each York Roast outlet draws customers in from the street with its mouth-watering theatre of the carvery displays in its windows. In 2012 the company approached Loyalty Pro for help to create a loyalty scheme. To help them engage with their customers, we built a bespoke loyalty scheme for the company which they called ‘Love Roasts, Love Locals’. The loyalty card was piloted in the company’s Chester branch and worked so well that it was rolled out to all their branches. It is now being used in all six sites across the country. Loyalty is now so important to York Roast that they promote their loyalty card on the home page of the website as well as on their Twitter and Facebook pages and in store. Sign up is quick and easy and customers are sent their loyalty cards in the post within a matter of days. On joining the scheme, new customers are given 300 points for free, which is equivalent to £3, and another 20 points when they buy their first sandwich. After that, one point is awarded for every £1 spent. As more York Roast stores open across the country, we provide a terminal for each counter and can offer staff training. The beauty of our systems is that they contain live data so at any time we can feedback how many loyalty purchases are being made and to what value. Across the brand, the Loyalty Pro reward system is helping York Roast process more than 8,500 loyalty purchases every year – and this number is growing. Our systems are helping the company to generate over £76,000 of loyalty spend annually. Wayne Chadwick said: “Today, our customers are crazy about our loyalty cards and they love building up their points and getting their due rewards. “It’s a very easy system to use and our team members find it simple to operate. In fact, we are so committed to it that when we’re busy we often put a dedicated member of the team on the till to sign up new loyalty cards. “We recently launched a new delivery service with Deliveroo and before Xmas we harvested our loyalty database and emailed out a promotional offer telling them about the new service. We also use it to send out offers of the month. “We’ve found that our customers use us again and again and really engage with the card – even posting up pictures of themselves in store on social media. “When we open new branches we have staff out in the street with tablets registering people and giving them free 300 point incentives to come into store. We are very proactive. “Each store manager is monitored to see how many loyalty applications they process each week with a league table drawn up of all the stores. We publish the results every week and our Kingston branch is often top. On average we sign up 50 new people a week – but during a marketing push one store could easily do this alone. “We’ve discovered that people love loyalty. They like something for nothing and it gives them a feeling of belonging. What’s great for us is that once they are hooked into our brand our customers tend to use it more. “The best thing about a loyalty card is that it helps us as a business to engage with our customers. Our branches are in a lot of tourist areas such as York and Chester and giving people a loyalty card is our way of making them feel loved on a local level. With 51 hotels across the UK with over 9,000 bedrooms and 6 holiday parks to its name, Britannia prides itself on offering the best value for quality accommodation. In 2011 the fast-expanding independent hotel group was looking for a loyalty scheme capable of growing with them. They had inherited a small manual loyalty scheme with 7,000 members after buying a chain of four hotels but wanted a more robust futureproof system. We worked closely with Britannia to help them create and deliver their Grand Rewards Scheme. Within two months of conception and with some bespoke programming, the system was up and running at the initial tranche of six hotels – on time and in budget. Loyalty Pro migrated their existing CRM database customers into the scheme, and sent them their cards in the post. We produced a training plan in conjunction with the client, and we created and customised terms and conditions for their roll-out. Cards and registration forms were designed and samples produced for approval. 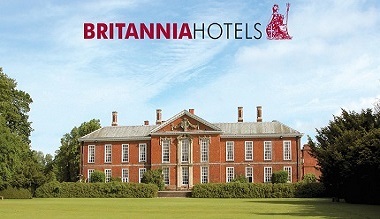 We integrated the card registration process with the existing Britannia website and provided each hotel with a terminal for their reception, enabling them to add points to guests accounts for everything from accomodation and conference & banqueting to food & beverage and health & beauty treatments. After only nine months of operation, our Loyalty Pro systems had processed over £1.4 million of loyalty transactions for Britannia Hotels. Today, we are proud that our systems are helping the group to generate more than £4.2 million of loyalty annually, and this number is growing year on year. Britannia’s Group IT & Project Manager Karen Pownall said: “At Britannia Hotels we take loyalty seriously because we know it is so important for the business. Today we have over 32,600 customers on our database and we want to make sure we keep them. “Our loyalty scheme is one of the most generous in the hotel sector with points available on everything from accommodation to food and drink. The scheme has been particularly successful at encouraging customers to eat and drink in our hotels rather than going to an offsite bar or restaurant. We can also reward our customers for booking direct with us rather than going to a 3rd party site which we would have to pay commission to. Our customers like discounts, enjoy collecting their points and then spending them at other hotels in our group. Maidstone Harley-Davidson is owned by independent family-run Laguna Motorcycles Ltd. Founded in the 1980s in Maidstone, Kent, the company has an excellent track record as a motorcycle dealer and prides itself on its great customer service and after sales care. As well as selling Harley-Davidson bikes and clothing and servicing bikes, customers are encouraged to pop in for coffee and meet up with fellow riders. We started working with the company in late 2011 helping them to define loyalty and to shape a variety of loyalty card solutions which they could promote to their customers. We listened to the team at Maidstone Harley-Davidson – who wanted to do something better than just offering a discount - and helped them to create their first Loyalty Card programme. Their distinctive Black loyalty card for the shop gives 2 points for every £1 spent. Customers earn points when purchasing any casual clothing, riding gear, merchandise, bike parts, accessories, servicing and MOTs – as long as the item is not in the sale or discounted. We also created a second Silver loyalty card which rewards customer spending in bike sales. Here, 3 points are awarded for every £1 spent. A third ‘Harvey Invicta’ loyalty card was created for members of the Harley Owners Group (H.O.G.). Maidstone offers this enhanced loyalty card to all registered members of the group to earn greater points (5 for every £1) on their purchases. Customers simply present a valid H.O.G. membership card or number in store and are provided with their exclusive card, for which they make an annual charge. The scheme is simple for customers to engage with and easy to set up. Staff at the store register customers on one of our two Wi-Fi enabled tablets, although they can sign up themselves via the website. Points can be printed out and spent as vouchers or saved up and used against clothing, riding gear, bike parts and servicing. In four years, our systems have helped Maidstone Harley-Davidson process over £1.44 million of loyalty transactions. Mary Felgate said: “Customer loyalty is extremely important to us. We want our customers to feel welcome and to know that we want them to keep coming back. It’s nice to be able to give them a card that they can use against future purchases and we have been surprised by how many people enjoy being able to build it up. “We regularly have customers buying big ticket items and saving up their points so they can come back at a future date and get a free service with us – using their points to discount the price. Some people spend their points as they get them, others stockpile them. But they all love the concept. “In fact, customers are often pleasantly surprised that they can even get points for using us for their parts, service and MOT. Unlike supermarkets and high street shops, we give more than just a few pennies each time they shop. “And unlike a lot of supermarkets, we only issue vouchers when the customer wants to spend them, meaning that vouchers never get lost or expire. “We also run special double loyalty card points promotions – or sometimes even triple – throughout the year. This can be a great opportunity to earn a big stack of points to save up and put towards something special in the future. “I would say that about 95% of our customers sign up for a loyalty card once we’ve explained the benefits to them. It doesn’t matter if they forget to bring their card to the store as we keep a record of their membership number on our system and can apply the loyalty points for them. “When they come in the dealership we can update them on how many points they’ve got and what that equals. It doesn’t take long for their points to build up. “One customer comes in regularly asking about his points. In fact, he’s happy to pay full price so he gets his full points allowance. He was saving up his points for his birthday so he could buy a new chrome wheel for his bike and wanted as many points as possible to put towards it. “Getting points is a feel good factor – people find it exciting saving them up and then spending them. Mainstreet is a multi site entertainment complex located in the town of Omagh in Northern Ireland. The scheme comprises of terminals located in five venues in a single street in the town. The venues are themed pubs, eateries, and a nightclub. All the analysis required to set the system up was completed in a single visit to the province, with the initial sites being installed on a secondary visit a month later. The scheme has been running successfully since July 2010, with the original terminals being exchanged for tablets in early 2014. By March 2015 over 200,000 transaction had been processed. As technology prices have reduced over the years we have reduced our charges accordingly. Mainstreet now pay over 40% less for the service than they did originally. These venues are extremely busy on Friday and Saturday evenings, so the system had to prove itself to be quick and robust enough to cope with the demand. Hence the initial install was limited to the eateries, but the throughput proved to be no problem and the scheme has since been expanded to provide extra terminals in the pubs and nightclub. The portability of our terminals also allows them to be used at a weather dependent outdoor bar in the summer months. Mainstreet use the printed voucher option, with vouchers being valid from the day of issue. Vouchers can be redeemed at any venue regardless of which venue issued them. Currently there are over 5000 cards in circulation, and we have recently supplied 1000 additional cards with an updated design. The cards are registered direct via the Mainstreet website to which we have attached bespoke customised pages for this purpose, or on the tablet at the time of issue. For non-internet registrees we provide customised forms on which the cards are attached. These forms are completed by hand by the registree, and entered onto the database by Mainstreet Staff. Specially branded staff cards with higher levels of points per purchase. Additional points on particular days of the week to encourage a spread of customers. Additional points within certain daily timeframes at some venues to encourage coffee drinkers etc. Mainstreet make use our web portal to inform the cardholders of upcoming events by email and by text. This has proven to be a very effective way of ensuring the local customers know what is going on at the venues.